For the better part of the early 2000s Tartan Films released some of the best genre movies to come out of Asia. Titles like Oldboy, Audition, Versus and The Red Shoes were made available in stores to buy or rent. The company introduced an entire generation of pre-streaming home video viewers to the likes of Takashi Miike, Park Chan-wook and Shinya Tsukamoto. Tartan Video without a doubt distributed some of the best Asian cinema to American audiences at the turn of the millennium. 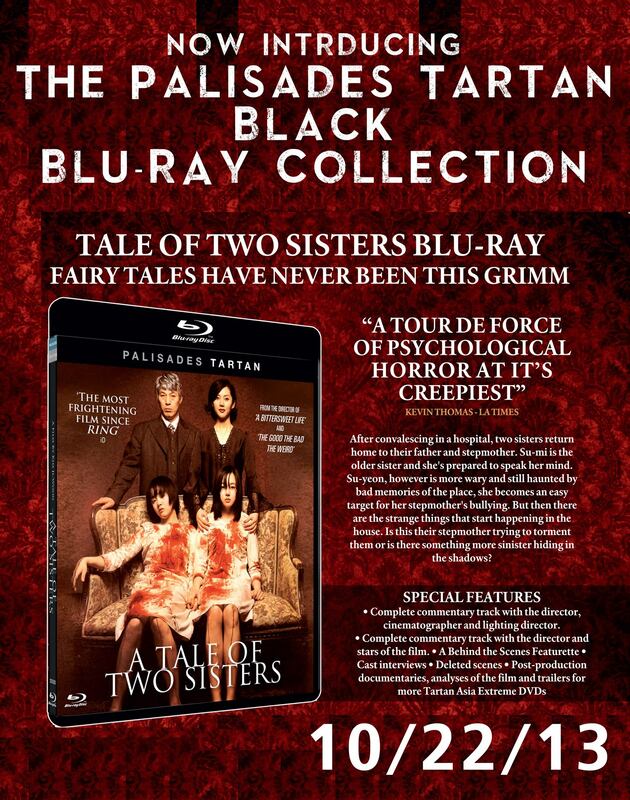 Today, the company now known as Palisades Tartan has introduced a new line of blu-ray classics from their catalog called the Black Collection. Here is the one-sheet for the A Tale of Two Sisters reveal set to be released towards the end of October. Hopefully they will announce more titles soon and if their quality is anywhere near the astounding level of excellence displayed by Scream Factory, we should be expecting amazing blu-rays of Gozu, Tetsuo: the Iron Man and Shutter in the near future.